He was an inventive person, but his job was not engineer or inventor... that was something he did with his spare time. It was only after hearing that Soviet soldiers needed a good reliable automatic weapon while in hospital AND the injury to his shoulder that gave him spare time that he started serious work on unique weapon development (as opposed to modifications and improvements). The submachinegun he designed was rejected because it was no better than the ones in service and was not so cheap to make. Its invention got him attention however because it was well designed... if he had been in a different army his weapon might have been adopted.... but this exposure got him access to better resources and factories etc which made designing easier for him. I rather doubt his first rifle was a variant of a Garand... that would be a step backward from existing Soviet rifles like the Tokarev and Simonov rifles of WWII. Actually, when the first AK-47s were manufactured, they were only issued to very select troops in the soviet army in 1949. On part two your friend is wrong, the Soviets had decided to adopt a battle rifle, an assault rifle, and a LMG... the first generation being the SKS, the AK-47, and the RPD respectively. It was relatively quickly realised that the AK could do the same job the SKS could do and that the SKS was fairly redundant and it was relegated to ceremonial duties like guard duty. The AK-47 originally had a sophisticated stamped steel receiver that was cheap and easy to make, but there were problems with durability and the receiver was changed several times. Finally the early 1950s version used a milled receiver (ie cut from a steel block) which is time consuming and more expensive and results in a heavier weapon. The AKM didn't enter full production till 1959, the AK (they called it the AK rather than AK-47) did not really have time to be fully introduced into service with every unit, but the low cost production of the AKM meant it entered service much more rapidly, though it replaced older rifles rather than replacing the AK. Until the AKM entered full production the AK was the standard assault rifle and was produced to replace all existing rifles... it was not like the An-94. OFB was producing an unlicensed version and they happened to show it off in a arms fair in India, where Mikhail Kalashnikov was present as a guest. He bitched a lot about it. As noted above, the AK-47 wasn't cheap compared to the SKS, it was the AKM design that was cheap. Incidentally, the price in some African countries is much cheaper than $334 (though they usually aren't Russian origin, but cheaper knock-offs). Legitimate rifles and rifles from "other" sources will vary in price dramatically. Osama was seen with a short-barrelled AKS-74U Krinkov in most of his video appearances. There is no such rifle as a Krinkov... Krinkov isn't even a Russian word. The correct designation is just AKS-74U. And that rifle is still a Kalashnikov rifle... normally seen with a 45 round magazine from an RPK-74 BTW. Frankly, I think it is a fairly common modification for many middle eastern rich people. Which doesn't make the assertion false. While researching rifles scopes and optics, I have seen that Russian soldiers often are using foreign made scopes and optics. Are Russian made scopes and optics not up to foreign standards? From the videos I have, there are lots of Russian made scopes and optics, how do they compare with Russian made scopes and optics? Russian scopes were for long time not in big serial production which made them more expensive due the low produced number, but they are becoming cheaper and cheaper but are on par and offer often a bigger varierity of scopes and sights for different jobs that are sometimes even cheaper than foreign sights. In the army, only russian sights. Police, VV MVD, SOBR, FSB, etc... Yes, they buy commercially, and russian also. It's rare to find not russian or belarussian optics, but you can find western ones in army sometimes, mostly on special sniper rifles, and sometimes eotech for spetsnaz, etc. How do those scopes and optics compare against standard US optics and scopes. depends, just as good, but heavier and more robust, 1P29 is old now, not as good as ACOG, but it's very robust and still good. PSO-1 is fantastic 4x scope, but it's big. 1P63 is modern reflex tunel scope, it's basically superb, no direct equivalent. 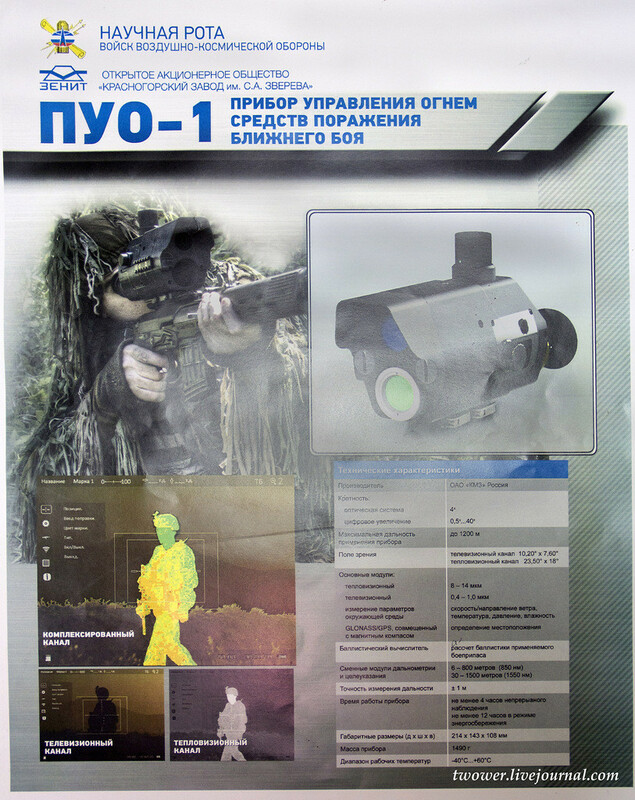 1PN93 is great night vision device, works on any russian army weapon, RPG-7 included. If some is buying rifles from aboard, can they pick, what optics and scopes they like or will it just come with standard? Some weapons come with scopes... like the SVD and RPG and derivitives, but with hunting rifles like Tigr you will likely buy the scope separately. It should be a fire control system for short range weapons. It has thermal and TV cameras plus sensor fusion functionality (and I think AI capability). Very interesting, but it will cost a fortune and even special forces won't have them in sufficient numbers, i asume. PUO-1 Device for controlling fire in close combat. There is not much to translate, technical mumbo jumbo and numbers. Small images show Combined channel of both Thermal and TV where targets are identified, marked and tracked. Second image shows TV channel. Third one shows Thermal channel. Ballistic calculations of bullet in use. So it's just a sight, not actual fire control device. It shouldn't be super expensive. The calculations are not that complicated... even a pocket calculator could do the maths quickly enough. The electronics in a modern smart phone would be good enough for $100. The thermal camera element could use a QWIP based sensor chip, which means it would be like a CCD chip in a modern video camera, but sensitive to visible light and IR frequencies. Mass produced such a chip would only cost a few dollars and would be a very cheap way of creating a scope that could be low light, IR, as well as image intensification as well. I have read about fifth gen II that detects the effect of light reflection off natural material compared with material that is dyed or painted or coloured in some way. Remember Ratnik is not intended for special forces... though they will get something like it... Ratnik is for the average soldier... eventually. Loosely translated, it is a "Near-range weapons-control device". At kilo+ in weight, not sure it would belong on an assault rifle, but something like that mounted on a Kord (both sniper rifle and HMG) or even Pecheneg is going to be interesting. Dual channel sensor (visual+ IR), ability to process & superimpose both, digital zoom (40+! ), may be stabilization. I wouldn't want to approach a defensive position equipped with one of these, day or nite. It can also be used as locating device - you know your pos, target's range and bearing and therefore its GPS coords. But a dedicated device with lasing capability is probably a better choice for that. So a forward observer could use it to pass the coordinates of targets to artillery or air power. With battle management systems appearing in armoured vehicles and on aircraft systems like these will be important to collect information for that management system and create a fuller picture of the battlefield. Even if the user doesn't fire a shot, the information he collects could be used for an accurate artillery attack. Wow, it has a ridiculous amount of capabilities...but unfortunately it'll probably cost at least $10,000 a piece even with the devalued Rouble. However if mass produced then the cost could go down by 2/3rds...but the real question remains, would the Ru ground forces want something like this? Safe the money from sniper training and buy this stuff, it does everything you need to do as a sniper for you, you are just the servant that carries it from point a to b. What does the Rouble rate have to do with its price? The cost of labor of manufacturing. To what extent the Russian labor rates follow the Rouble rate?